This behemoth reposing at the edge of the water is equal measures magnificent and intimidating. 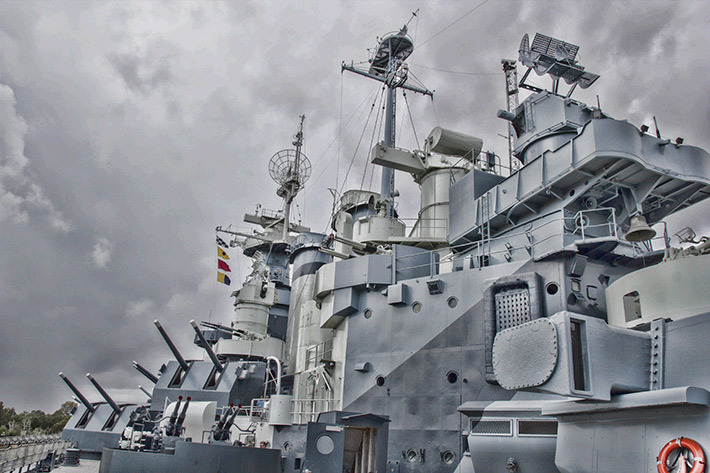 Retired to Wilmington, North Carolina in 1961, this impressive vessel was the most highly decorated American battleship in WWII. Commissioned in New York City on April 9, 1941, the USS North Carolina was involved in every major naval offensive in the Pacific Theater during WWII. At nearly 729 feet long, it took 2,339 sailors to comprise a full wartime complement of the North Carolina. Her top speed was 28 knots, and she was propelled by four electric steam turbines and eight boilers. Sporting a more streamlined silhouette than her battleship predecessors, the USS North Carolina was constructed using a new (welded construction) technique to reduce weight. Decommissioned in 1947, and removed from the Naval Vessel Register in 1960, the ship was purchased for $330,000, money raised by North Carolina students’ Save Our Ship (SOS) campaign. Touring this imposing ship, it is unsettling to imagine the crew’s life; spending long stretches of time trekking through the narrow corridors, windowless quarters, and stifling (and probably hot) depths of this huge ship. The close proximity of column after column of suspended metal beds certainly gives one pause. If nothing else, this museum serves to remind us of the sacrifices members of our armed forces make every day to protect our lives and our country. Situated down a narrow country road, this beautiful covered bridge spans the waters of the Marsh Creek in Gettysburg. 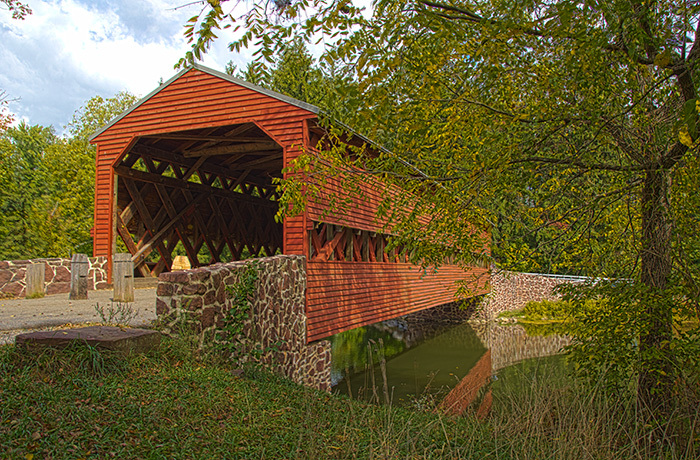 Sachs Covered Bridge was originally built before the Civil War in 1854, and was added to the National Register of Historic Places in 1980. A flash flood in 1996 significantly damaged the bridge and washed it from one of its abutments. Now closed to vehicular traffic, this 100-foot bridge is one of less than 900 covered bridges (of more than 10,000) left in the United States. Used by troops during the Civil War, there are rumors of ghosts haunting the bridge.